On the afternoon of August 21, 2015, on a train headed to Paris from Amsterdam, an Islamic terrorist named Ayoub El Khazzan exited a bathroom with a AKM rifle and 300 rounds of ammunition. The first person to try and stop him was Mark Moogalian, a 51-year-old American-born Frenchman, who wrestled the rifle away from El Khazzan but was shot in the back with a pistol Moogalian did not know the terrorist was carrying. With his rifle and rounds back in his grasp, El Khazzan made his way to the passenger car. 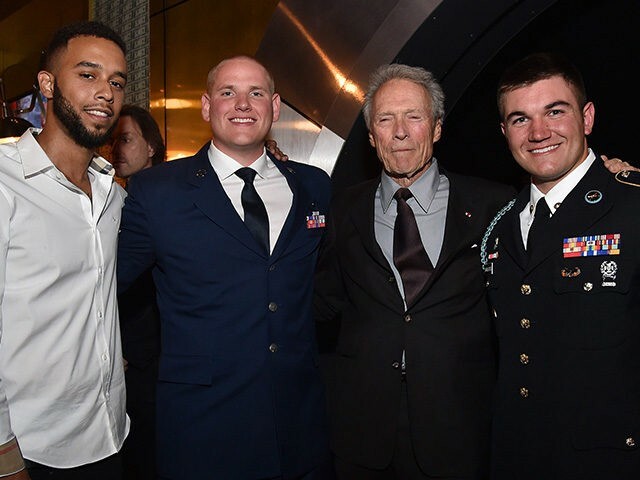 It was here that he met up with three Americans, three lifelong friends enjoying a European excursion together: 23-year-old Airman First Class Spencer Stone, 23-year-old Anthony Sadler, and 22-year-old Specialist Alek Skarlatos. It is the story of the American friends that producer/director Clint Eastwood wants to tell. In fact, the three-time Oscar winner is so interested in these three, he had them play themselves in a $30 million studio film. The opening scene is a doozy, a sharp stick in the eye of public school tyrants eager to feed drugs to boys as a means to control their behavior, or “to make your job easier,” as Spencer’s mother (Judy Greer) puts it just before Spencer and Alek are placed in a Christian middle school. The Christian environment does not, however, calm the boys’ behavior, and it is in the principal’s outer-office where they complete their trio with Anthony, a street-wise charmer who proceeds to lead them into even more trouble. Eventually real life intrudes and they go their separate ways. For Alek and Spencer, that means life in the military. Alek is eventually deployed to Afghanistan while Spencer struggles to find his way in the Air Force. In the summer of 2015, while they are still young and unencumbered, they decide to get the band back together for a trip through Europe. Near the end of the vacation, they find themselves on the 15:17 to Paris. The only way I can describe Eastwood’s highly original approach to this story is to call it a populist art film. To begin with, the screenplay, written by Dorothy Blyskal, and based on the book written by our three heroes with Jeffrey E. Stern, primarily focuses on just how American these three guys are. As kids, Spencer owns an arsenal of toy guns that would make a SJW cry. The boys love to play army, to shoot at each other, to get in trouble. They pray to God and work at the local Jamba Juice. Spencer and Alek are white, Anthony is black, everyone is colorblind. These guys like pretty girls, enjoy some sin in Amsterdam, are unfailingly polite to everyone, and, as young men with so much life in front of them often do, they talk a lot about life’s ultimate purpose while snapping countless selfies. That is the populist part. The art film part is Eastwood’s overall approach — which is as close as a narrative movie could ever come to a documentary. Although amateurs, the three key players are surprisingly natural actors. Their dialogue is also natural, which means it avoids the smoothness of moviespeak. You are going to hear a lot of “likes” and “you knows,” just as you do in real life. Because the central event only lasts a few minutes, there are 80 other minutes to fill, which Eastwood does without dramatics or anything that feels Hollywood. A thing called life just happens to these guys, and it is oddly compelling. The pace does slow a bit once we arrive in Europe. The travelogue takes up a heavy amount of time and, as they travel from country to country to country, it all starts to feel like you’re being forced to watch someone else’s home movies. But by the time the terrorist shows up, you see Eastwood’s purpose behind this. By casting three ordinary guys to play their ordinary selves, by showing us their ordinary lives, their ordinary friendship, and their ordinary vacation, it makes that moment when they become extraordinary unspeakably moving; a shock to the senses, a true act of bravery and selflessness (to say the least) made all the more truer because these are not movie heroes. From the opening attack against bureaucrats and their Ritalin, to watching boys playing in the woods with their toy guns, to the opportunities to become your own man in our military, to the selflessness of the Christian faith, to their proud masculinity, Eastwood is saying one thing above all — that if you will just let American boys be American boys, there is a very good chance they will grow up to be extraordinary men.